Supporters and opponents of new import tariffs make their final pleas before government officials. A divided U.S. solar industry had its last chance to sway President Trump’s decision on solar tariffs at a hearing in Washington, D.C. on Wednesday. 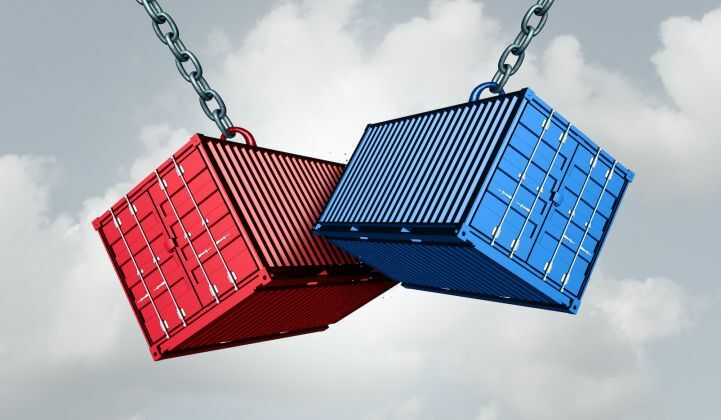 More than 60 witnesses testified in a cramped conference room at the Office of the United States Trade Representative (USTR) during a final eight-hour public hearing on the Section 201 trade case. The USTR is tasked with advising the president on how to handle the controversial trade remedies recommended by the U.S. International Trade Commission (ITC) in October. United States Trade Representative Robert Lighthizer, a Trump appointee who heads the USTR, did not attend the hearing, however. Solar executives, lawmakers and foreign diplomats presented their arguments instead to an eight-person panel comprising representatives from several federal agencies, including the Energy, Commerce and Labor departments. The vast majority of witnesses urged the panel not to recommend solar tariffs or quotas, saying they would put American jobs at risk. “It makes no sense to effectively tax tens of thousands of good-paying U.S. jobs out of existence, solely to benefit the commercially unskilled Chinese and German owners of Suniva and SolarWorld, who will cut and run,” said Michael O'Sullivan, senior vice president of development at NextEra Energy. U.S.-based manufacturers Suniva and SolarWorld brought the case earlier this year, citing serious financial harm due to cheap solar imports. The companies chose to invoke Section 201 of the 1974 Trade Act, which is an obscure part of U.S. trade law that could allow the president to implement tariffs, minimum prices or quotas on solar products hailing from anywhere in the world. Suniva filed for Chapter 11 bankruptcy protection in April, while SolarWorld raised $6 million to keep its doors open and its factory operational while fighting the trade case. Members of the panel showed particular interest in a proposal by the Solar Energy Industries Association (SEIA) to implement an import license fee system for crystalline silicon PV (CSPV) panels instead of tariffs. The fees would be collected from foreign solar manufacturers and redistributed to U.S. manufacturers. SEIA pitched the licensing fee previously to the ITC, where the idea gained momentum with one of the four commissioners. In her recommendations to President Trump, Commissioner Meredith Broadbent proposed selling import licenses at a minimum price of 1 cent per watt. “Are any of the remedies recommended by the ITC commissioners likely to result in a positive net-revenue stream for domestic producers?” asked Ian Steff, who serves as deputy assistant secretary for manufacturing at the Department of Commerce. “Could you walk through the cash flow here? […] What’s the timeline look like?” asked Charlie Gay, director of the Department of Energy’s Solar Energy Technologies Office. “We forecasted that at least $833 million would be collected in ILF revenues over the next four years,” said Sunrun co-founder Ed Fenster. He contended that license fee revenues would reach solar manufacturers within three months, while it could take more than a year for companies to see a financial benefit from tariffs. “Our opponent’s proposal relies on China and their proxies to supply the U.S. market with solar,” said Card, who denounced the plan. More than 200 solar workers and industry advocates marched from the USTR building to the White House on Wednesday afternoon, waving signs that read “Don’t bail out losers” and “Solar feeds my family.” The trade agency has received more than 1,500 public comments from industry groups, businesses and solar workers, the vast majority of which called on the government to reject the tariffs. “I’m worried about everybody’s job, realistically,” said Matt Kata, 32, who works as an electrical designer for Cypress Creek Renewables in Durham, North Carolina. Kata was among dozens of Cypress Creek employees who traveled to Washington to demonstrate against the tariffs. The proposed remedies offered by trade commissioners in October were less severe than the tariff rates requested by Suniva and SolarWorld, but SEIA says they could still wipe out tens of thousands of solar jobs. Two out of four commissioners were in favor of placing a 30 percent ad valorem tariff on imported crystalline silicon PV modules, to decline by 5 percentage points per year over four years. For imported solar cells, they agreed on a four-year "tariff-rate quota" that would allow for up to 1 gigawatt of tariff-free cell imports. Any imports over 1 gigawatt would be subject to a 30 percent tariff. Each subsequent year, the tariff rate would decrease by 5 percentage points and the in-quota amount would increase by 0.2 gigawatts. Numerous industry executives testified that the threat of tariffs and quotas has already impacted their businesses. Robert Rynar, a chief engineer with Depcom Power, said his company started working on two 100-megawatt projects between 24 and 36 months ago. “Due to the uncertainty of this case and its effect on the cost of modules…both of those projects are teetering on collapse,” he said. A representative from the Embassy of Canada said Canadian modules should be exempt from tariffs, even if they are assembled using cells from Asia, citing the rules of the North American Free Trade Agreement. Two state lawmakers from Minnesota, Senator Justin Eichorn and Representative Jason Metsa, threw their support behind Canada. Suniva’s lawyer, Matthew McConkey, said no such exception should be made for Canada. “If you take a Korean cell and send it to Canada and put it into a module in Canada, that product has to be covered by this order,” he said. Representatives from South Korea, China, Taiwan and the European Union also testified against the trade remedies. It is not known how the Trump administration will rule on this case. The president has made it a priority to support American jobs; the question is whether he believes protectionist policies are the best way to do that in this case. Last week Lighthizer asked the ITC to prepare a supplemental report to help the president determine an appropriate way to help the domestic industry adjust to import competition “and provide greater economic and social benefits than costs.” He also asked the commission to detail any "unforeseen developments" that caused domestic solar manufactures to be injured by cheap foreign imports.